In the notes for the CD of her violin concerto Exultet composer Edith Canat de Chizy explains that ”The idea of ‘sound matter’ is very important to me. I started to compose after having been involved in exploring acoustic materials. I first came into contact with this matter at the [Paris] Conservatoire with Ivo Malec. So the starting point of composition for me was when I began to work a block of matter. I start with the raw material. I sculpt it and it slowly takes form”. Classical music and acoustics are inseparable and there are also close links between music and architecture: Iannis Xenakis worked with Le Corbusier and John Cage worked with Ernő Goldfinger, Wagner specified a sound diffuser at Bayreuth to achieve the perfect remix for his operas, while Bruckner built cathedrals of sound as monuments to his “beloved God”. However the sonic architect par excellence was Bach, as a concert yesterday by the Academy of Ancient Music and Richard Egarr illustrated so graphically. Musically the concert was guaranteed to be auspicious: the AAM under Egarr are one of the best early music bands around, and you cannot go far wrong with Bach’s four Orchestral Suites. However the venue was hardly auspicious, a new municipal multi-purpose auditorium in Bury St Edmunds, a provincial town in the English home counties with no tradition of classical music. 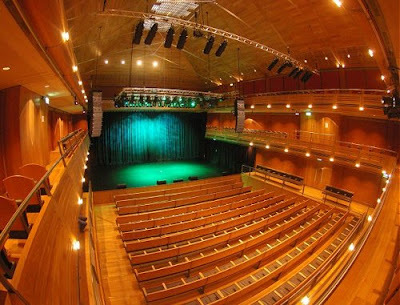 But when Richard Egarr told the audience in Bury last night that “you have a gem of an auditorium here” he was dead right. And he is putting his money where his mouth is by staying at the Apex - seen above - this week with the AAM to record the Orchestral Suites for Harmonia Mundi. Built in 2010 at a cost of £18.5m on the site of Bury’s former cattle market, the Apex is part of a major redevelopment to revitalise the town centre. Hopkins Architects designed the 500 seater hall and in an inspired move the town council retained top consultants Threshold Acoustics to voice their new auditorium. 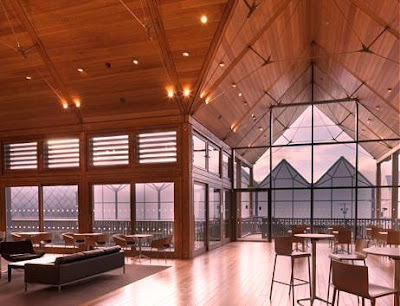 Chicago based Threshold Acoustics has worked on venues including LSO St Luke’s and the Barbican in London, and the Verizon Hall in Philadelphia, while the pitched wooden roof of the Apex seen above contributes to the signature bloom of the sound and has resonances – in more ways than one – of nearby Snape Maltings. As if sonic excellence was not enough, the auditorium seating rests on floating air-bearing wagons that allow the hall configuration to be changed with power-assistance – watch the video here. In a reversal of current trends for multi-purpose venues, the American white oak faced and carpet-free auditorium is voiced in favour of unamplified music, a decision which prompted limited post-build fine tuning to the unusually live sound. Classical music’s new orthodoxy preaches that acoustically excellence venues such as the Apex must be sacrificed on the altar of populism. Which is spinach: acoustics are part of the complex DNA of classical music which nobody fully understands – least of all those preaching the new orthodoxy - and we tinker with it at our peril. 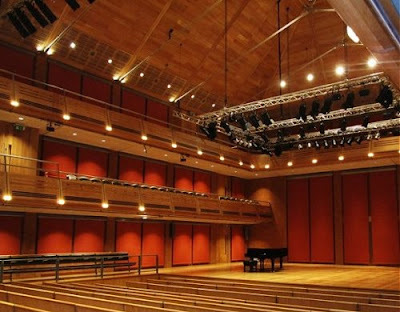 It is a pity that those who are telling classical music how to reinvent itself were not in Bury St Edmunds last night. Richard Egarr has declared that his mission is to bring the spontaneity and subjectivity back into early music; his direction is flamboyant and the Academy of Ancient Music musicians – brass and winds play standing – moved in the Bach in more ways than one. The Apex, with its light airy public spaces and views across the town centre is not at all forbidding - see photo below. Spontaneous dress code on and off stage was smart-casual and there were many young faces in the audience – the front two rows were taken up by a diverse college party. Early music on a wet February Sunday night in the provinces is not the easiest sell, but the Apex was almost full. And, most importantly, the music and the sound rocked - job done. Also on Facebook and Twitter. My ticket for the Acaemy of Ancient Music concert was bought at the Apex box office. Any copyrighted material on these pages is included as "fair use", for the purpose of study, review or critical analysis only, and will be removed at the request of copyright owner(s). A lot of good news in this post. I especially like, "brass and winds play standing". On a whole different plane, my little group did some Dixieland jazz this past weekend, and I played the banjo standing - bopping along with the rhythms - and got a lot of people moving/dancing with us. Part of what can make classical music seem like "other" to me is players acting and looking like automotons instead of human beings. That makes performances seem more like rituals of the past than something fresh and in the now.